Recently, in an effort to expand my beer horizons, I had G-LO over to debate the merits of smoked beers. I had picked up two beautiful bottles from Brauerei Heller-Trum / Schlenkerla. 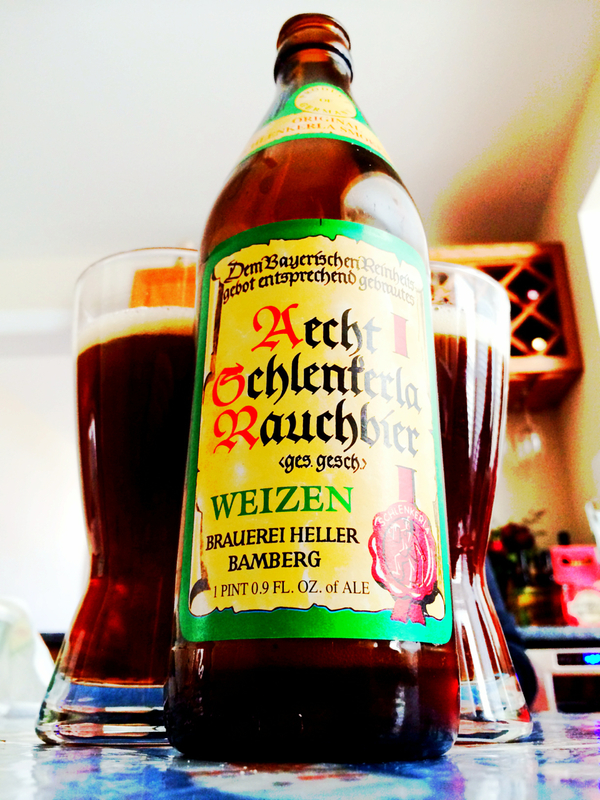 The first was the Aecht Schlenkerla Rauchbier Urbock which I found to be fantastic. The second is the Aecht Schlenkerla Rauchbier Weizen. At the 2014 Australian International Beer Awards, this beer won the Gold medal in the smoked beer category and the brewer won the Cryermalt Trophy for Champion – Medium-sized International Brewery. Schlenkerla Smokebeer Wheat is an ale with light smoky aroma. As Bavarian wheat beers, it is being brewed with a mixture of both barley malt and wheat malt. The portion of barley malt is hereby a classic Schlenkerla smokemalt, while the wheat malt remains unsmoked. Served unfiltered with its natural haziness, Schlenkerla Wheat reaches its full aroma through bottle fermentation with fine top fermenting yeast. Appearance: A little layered with a light brown top, and orange-ish middle and a lemony bottom. Aroma: Light smoke, citrus (lemon) with a good bit of sweetness and a little bit of dough. Taste: A well-balanced, wheat beer that hits all of the notes of a really, good wheat beer with the added hint of smoke. I didn’t like this one as much as I liked the Urbock. Not that there is anything wrong with this beer; it is still a really, really good beer. For me, I think it is more a question of the style; I am just not as big a fan of the wheat beers as I am of a heavier beer like the Urbock. One work of caution; this beer is bottle conditioned so as you pour it out you need to beware the residual schmutz in the bottom of the bottle/glass. I had a hard time finding this in Germany! Where did you pick this up? I picked up the bottle at Kress Liquors in Cherry Hill, NJ. How does one pronounce schmutz? Is it schmutz as in putz or schmutz as in foots? Just curious. And yes, I realize that I have just opened myself up for an insult of sorts. I always say it like putz. Good review. At the very least I know know what the label says. In the past I haven’t been able to get past the second word without getting bored and walk away. Not putz or yutz but schmutz as in puts (not foots which is actually feet my Sicilian friend). I say schmutz like foots. Let me as Krouse. Not foots (that’s feet) but puts. Please don’t encourage G-LO’s assault on the English language. So, I need to spin the bottle? Not that you aren’t attractive in your own way but I don’t think so. I’m patently opposed to anything I generally can’t spell or pronounce or sounds like a few missing verses from Wagner’s Ring third act or the brand name of Otto von Bismarck’s helmet. How can this be something someone would want to ingest? And take notes on? Makes no sense. Schmutz is schmutz just don’t confuse it with schmaltz or single schmaltz whisky (THAT’S MINE! I JUST MADE IT UP! DON’T STEAL IT LIKE I WOULD IF YOU MADE IT UP!). I’m pretty sure the guys who make Loch Chaim have rolled out an anniversary bottle of Single Schmaltz Whisky. It’s about time he comes through.